Some screen shots prior to the deletions. I'm guessing he didn't realize that it was going to be found by LRC and used it as a sandbox. His heart probably stopped when he realized what he had done. Like I said, I have it all. I'm going to upload it all to a new strava account. RE: Robert Young fakes run across America 6/24/2016 2:23PM - in reply to irondequoit? I invite you to focus on the elevation grade up a hill of about 1100 ft between mile 5 and 6 of this miraculous run. He only slows from about 5:56 pace to 6:15 pace for that 1100 foot one mile climb! Impossible for a human being to keep that pace during a transcon. But not impossible for an RV. Yeh, the amazing 28 miles in the 32-miler was just one of the first ones I saw. The uphill paces are even more damning, such as miles 17 & 18 in 5:44 and 5:34 with 300' elevation gain at over 5500' altitude in this 24-miler. 24 miles at a pace equivalent to a 2:53 marathon with 2100' elevation gain (most at the end) all over 5000' altitude. 2:45 and 2:53 for a marathon is a decent mark for a flat course at sea level like London for a recreational runner, but RY's PR is 3:07 at London 2015. Attention. RexusDustin (this is Dustin Brooks) is whitewashing his Wiki bio. "RexusDustin (talk | contribs)â€Ž . . (14,355 bytes) (-528)â€Ž . . (It is not reasonable to put that Rob Young is suspected of cheating in his summary at the top.)" What!, he's not suspected of cheating? "RexusDustin (talk | contribs)â€Ž . . (12,599 bytes) (-2,635)â€Ž . . (Removed untruths and edits intended to tarnish the reputation of the man, without basis in fact or evidence.)" What!, without basis in fact or evidence? RE: Robert Young fakes run across America 6/24/2016 2:24PM - in reply to irondequoit? His problems today are of the "public shaming" variety. I think his problems in a few months are going to be of the financial kind. All this stuff from SKINS about a panel of highly qualified, independent experts makes me think this is headed toward 1) he cheated and 2) they want a lot of money back and might even sue him for damages. The "finding" won't "clear his name" and open SKINS to a bashing from all of us trolls. They aren't going down with this ship. He's gonna fry. This awesome thread just set a PR for awesomeness. Asher and team1.kml should be our Presidential candidates instead of the two bozos we have. Ahahahahaha, this is even better than when he was "running". It's like a Pink Panther movie. They may have just gotten REALLY lucky. Quick, screenshot your pages with those interesting segments up. They pulled all the data from that account, changed the name, and changed the location. Reading Strava policies, the time data is stripped from the GPX file when another user downloads them so all I have is track data, no timelines. Sorry. Back to screenshots, folks! If you still have strava tabs open, screenshot and imgur them! Don't refresh, the activities are gone. For example this one - it's actually 1.5 hours longer. RE: Robert Young fakes run across America 6/24/2016 2:27PM - in reply to irondequoit? If anyone has the time and the GIS skills to do this, it would be interesting to see a map showing all of the strava uploads. Presumably this would show some big gaps between some of the runs (bigger than could be accounted for by the"forgot to start the watch excuse). Perhaps the missing data could convince some of his fans that he cheated. RE: Robert Young fakes run across America 6/24/2016 2:31PM - in reply to irondequoit? 28 miles (miles 2-29) in 2:57:39 (6:21/mile pace) in the midst of a 32-mile run at 4000' elevation (granted, the route does drop 600'), in the midst of a 70-80 mile day, after 2 weeks of 70-80 mile days. Oh, and this was the day (May 29), he played a pick-up game of football afterward. And you haters doubt him, why? Err, on second thoughts, you be right, the mans a cheat. That link is amazing and to think I used to believe in him. That info should be sent to Mr Fuller at Skins. Yup. Which is why it took weeks to do. Still, if you were a logical thinking person, you would have noticed this weeks ago like we did. Scrubbing comments and I assume blocking people. I can no longer post. I used to be able to comment on the photos and the posts on MarathonManUK. Now I can only view comments. Does that mean I'm blocked? I guess publicly asking for data on the TomTom screenshot images was cause enough to get me blocked. How does that work? I never received any notification or email from FB about getting blocked. I copied a few - how is best to share them with you rather than randomly in imgur? 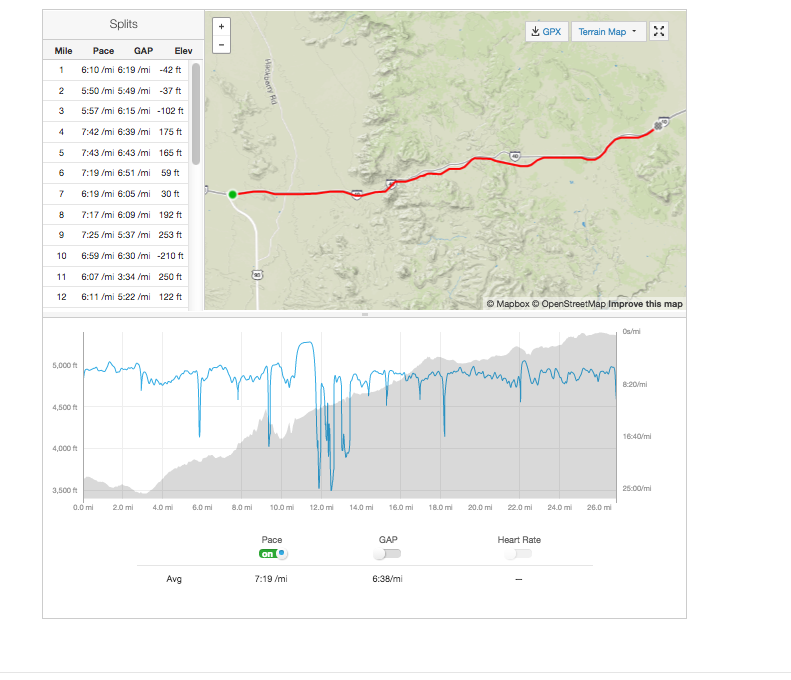 I emailed Fuller with evidence that Rob is manipulating the data (lack of cadence/HR, that cropped run on the desert day), suggesting he secure the TomTom account immediately. The poster that made the comment of the differences in the pace graphs when he is running vs when he is riding in the RV wins post of the day. It is crystal clear when he is doing his 6-9 mile runs followed by 2-3 mile walks vs the RV paces! I just downloaded it all, some of it twice (They are all named Night Run, Lunch Run, Morning Run, Evening Run, and sometimes I lost track of what I had already downloaded). He must have been pressured to do it by his sponsors or else he's just really dumb to release this and still proclaim his innocence. These really are damning, even if they did strip the HR and/or cadence data. Not sure where you want me to post it or if anybody else has done the same, but know there's a copy of his and Joanna's right now. Yep, he should just give up the act at this point. Nice work on downloading. I'm not itching to look at it right now, just hoping it is saved in case it's possible to edit it. I have a few screenshots from the non RY account of two of the runs including the night with the sub 4 mile and sub 1:45 half mile, and one of the run labelled evening ride. Is the whole mile at 4 minutes, or is it an estimate based on a 60 second downhill 400 meter segment?